Named after a Russian tsar, Alexanderplatz is now a bustling commercial center of the German capital and is popular thanks to the wide range of shops. The Alexa Shopping Center alone has 180 shops and 17 restaurants. Come and enjoy our spacious, newly renovated rooms. 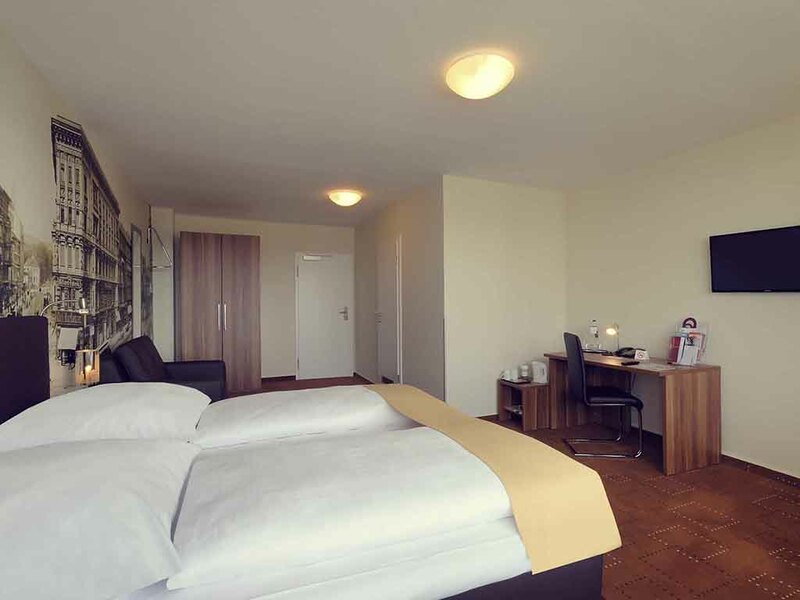 All 186 rooms in the 3-star Mercure Hotel Berlin Alexanderplatz are 323-sq. ft., and the 12 Suites are 646 sq. ft. Our Standard Rooms have two single beds or a double bed. The 12 luxuriously furnished Privilege Rooms feature twin beds. The Suites have two separate bedrooms, each with a single bed. Each room has free WIFI, and one child up to 12 years of age may sleep in their parents' room free of charge. Cool down or warm up: Wind down in our bar after a busy day or kick off your Berlin nightlife experience with a cocktail, beer or glass of wine from the Mercure wine list. The bar is open from 2pm to 2am.